"'April in Paris' boasts an enchanting score by Vernon Duke, with lyrics by E. Y. Harburg and Sammy Cahn. Day's delicate phrasing of the title song imbues the lyric with a melancholy that is most affecting. The film's musical highlight, "I'm Gonna Ring the Bell Tonight," is a rollicking dance performed by Day and Bolger in the kitchen of the ocean liner. Even LeRoy Prinz seems to have been inspired by Duke's music; it may well be the best number he ever staged." - George Morris, "Doris Day"
Not a great year for DD films, this one co-starred dancer Ray Bolger. The film thus starred two dancers, but they only danced together on one song. No special tunes and no soundtrack released. But the title tune as a single release became a Doris favorite. Miss Ethel 'Dynamite' Jackson (Doris) is a chorus girl who mistakenly receives an invitation from the State Department to represent the American theater at an arts exposition in Paris, France. There's only one problem, the invitation was meant for Miss Ethel Barrymore. Meanwhile, S. Winthrop Putnam (Ray Bolger), the bureaucrat who made the mistake tries unsuccessfully to correct his mix-up. After his initial panic, Winthrop is happy to learn that the media has picked up on the story which in turn has made Sherman his boss believe that selecting the likes of Miss Jackson is a stroke of genius. The trip is a big disappointment for Ethel as it entails many lessons in refinement so that she doesn't embarrass the US government. Although Ethel and Winthrop get off to a rocky start because of many of these issues, the two fall in love. Sam, as Ethel calls Winthrop, has to decide if his love for Ethel or his career is more important. The course of true love is assisted along the way by Philippe Fouquet, a womanizing French national in the US, he, penniless, who is trying to make his way back home to Paris. The film highlight takes place in the ship kitchen with the song, "I'm Gonna Ring the Bell Tonight". 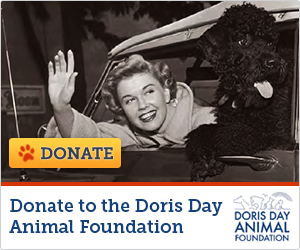 Doris will also be remembered for the scene in which she sings a song along with a raft of French Poodles all dyed in different pastel colors of the rainbow (a scene which she dislikes). Ethel S. "Dynamite" Jackson: I'm sick and tired of taking orders and I'm not going to finish my dinner. I'm not going to go to my room, either. In fact, I don't know what I'm going to do. But take my advice, gentlemen: Hang on to your life preservers! Ethel S. "Dynamite" Jackson: Say something! S. Winthrop Putnam: What a built! Ethel S. "Dynamite" Jackson: Just twist my arm and I'll agree Paris is getting to me. Ethel S. "Dynamite" Jackson: Everybody gets to kiss you but your own wife. S. Winthrop Putnam: After all this is France.